This was my second time running the Legend course. I ran this last year as well. The great thing about it is that with the rain the night before the race, it made for quite a muddy run and felt like a much different race. The race was well organized, a fantastic course(which is why I came back) and I used it to celebrate my running buddy's birthday. I would not hesitate to come back again. This race is so much fun! Registration was super easy as it always is with Running Fit's events. All you did was go onto the race website(they have a website for every race they offer) and complete your registration online. It was easy as that. It was an early morning as my running buddy and I were set to meet at 5:30am and drive out that morning. Yes, you can camp the night before but it's about 1:30-1:40 to get there and not that big of deal. It was beautiful out that morning and I grabbed a picture of the cool sun over the foggy fields. We got there a little after 7am and there was already people getting their packets. You also had the opportunity to get your packet the night before the race as well. We had plenty of time so we took a look around the park and chatted with some other runners. The race had a few port-o-johns which seemed to be enough. There was also regular bathrooms too which was nice. The park is really a hidden jem and I can imagine it would be fun to camp there. The lake was nice and calm this morning. While the race emailed race bib numbers to the runners, they also had them hung up by the trees so you could get it there too. It was a similar setup to last year and was very organized. Registration was in full swing and we got our shirts, buttons and race bibs and took them back to the car. The registration and start area is right next to the parking lot making everything very easy. I saw Crystal, who I ran with at the Friday the 13th night training run in June. She was volunteering for the race and got my packet. After we got our packets, I got some pictures of the start area. Again, it was set up similar to last year with the start near the lake. You also had the opportunity to register that morning if you had not registered already. Running Fit was all set up and ready for the runners by the time I got there. A girl that follows the blog recognized me and introduced herself. Sorry, I couldn't remember your name!! I love when people come up to tell me they read the blog and like it. There's times I wonder if anyone reads it so it's nice to get some nice comments at races. Before our race started, we were chatting with runners and also watched the five milers go off. The race started with the five milers and then the half marathon and 10 milers went after them. Once again no National Anthem before the race. I'm not sure why Running Fit does not do it but I prefer to start with it at races. We got into line and the race started. There was a wave start to help ease the congestion at the start. It was a good move as it would be terrible at the start otherwise. I had no goal for the race except to enjoy myself and that I did! I was supposed to run 20 miles today since I have the North Country Full in three weeks. 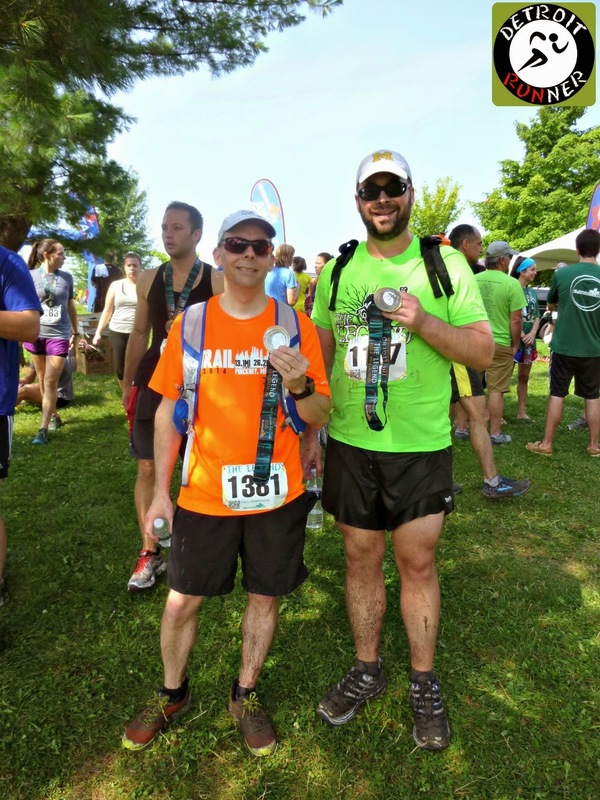 As an alternate plan, I ran 5 miles on Friday, then this race and then 7 miles on Sunday. It tired me out as much as a 20 miler. Since it was pretty much a training run for me, the only thing I wanted to do is not push the pace too much and finish feeling good. I accomplished that and it made for a really enjoyable race. 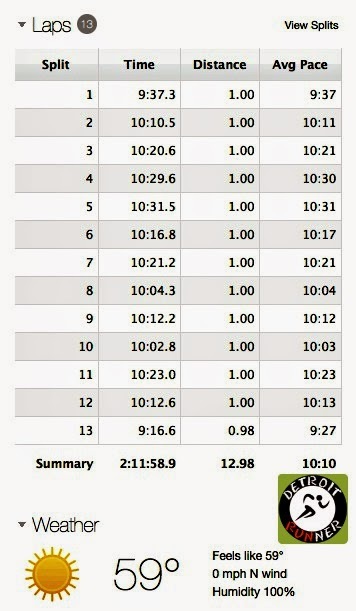 I didn't go crazy and kept most splits in the 10/mile pace. 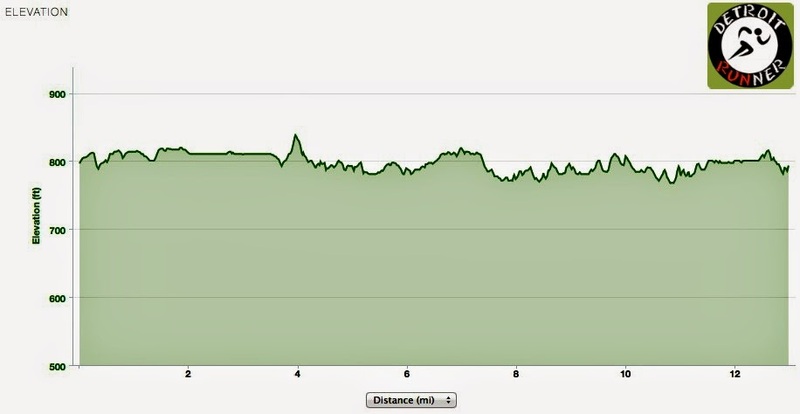 As you can see, the elevation is not extremely tough and if you were racing it, you could really get a great time on this course. The race starts with a small portion in the parking lot. Of course, it's my least favorite part of the course but you are not on it long and on the trails before you know it. While it was a bit crowded at the start, I felt like I lined up pretty good. I ran with Shawn for a little bit and let him go ahead since I wanted to keep the paces slower. I commented how the course didn't seem that wet given it rained all day the day before. It had some good drainage. Little did I know what was coming. Next we ran through the campground. Most campers were either sleeping or getting breakfast ready. You could smell the bacon cooking and it smelled so good! Maybe the race should have had a bacon aid station? Haha! After a short run through the campground, we were headed back on the trails. There were three flag colors - blue for the 5 miler, orange for the 10 miler and white for the half marathon. 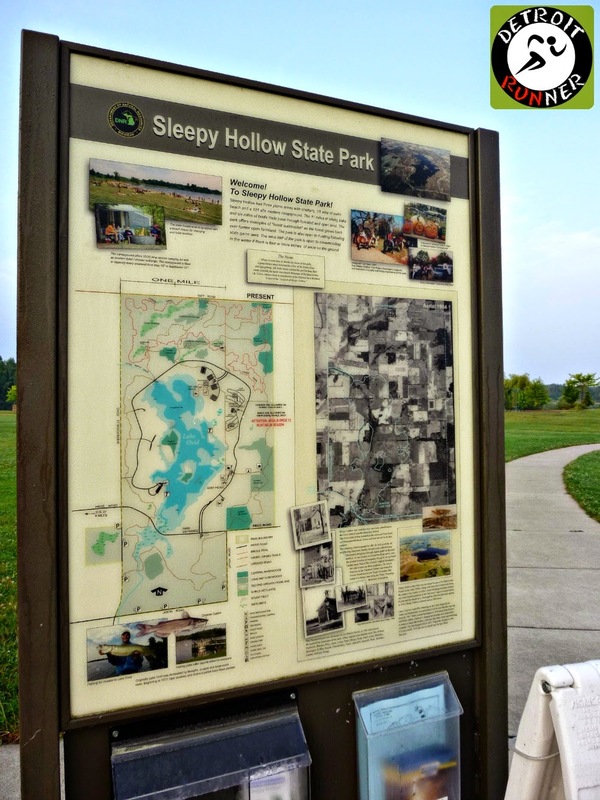 It's one thing you need to pay attention to when running the trails. DON'T follow the runner in front of you! As we got to mile one, there was volunteers there cheering for us as well as watching out for traffic. While we didn't get stopped by any cars, the road was open to traffic. While much of the course is single track, there is typically plenty of room to pass other runners when needed. You can see one passing me below and she had plenty of room. A simple, "on your left" and people moved out of the way. While there were some parts that were a little wet and somewhat muddy, it was not bad overall. I really love this trail because it's not on a huge elevation. It also has lots of different terrain including grassy parts, single track, forest areas, fields and mud too. It has a great variety. I did a little research on the sign below. Tohst rox from what I can find means "Torture Chamber Bond" Haha! Yeah, I can attest to that if that is what this really means. This was also at the half way point of the race. I don't know why but the field below is one of my favorite parts on the trail. I guess I love seeing all the runners in a curved line continuing to run. Before we knew it, we were at the split between the 10 mile and the half marathon. Running Fit did an excellent job marking the trails and I never felt like I would get lost. Up until this point, my shoes were quite dry and just a little muddy. It was back to some more single track and the sun was shining! Then it started.........yes, the mud! Oh, the mud! Many spots up until now, we could just run around it and even a few spots here too but there were numerous spots(like the one below) where you were not getting around it. The last three miles were the muddiest I've ever run in a trail race. It was so much fun! After you had mud and water in your shoes, it didn't matter much and there was no need to run around anything anymore. Isn't that why we signed up for this? Bring on the mud. Being out in the sun also made the later part of the race more difficult as it got hot and humid. As you can see below, there was a huge mud path and there was no getting around it. My feet were just covered it in. I laughed because the runner in front of me was trying her best to stay out of it. For those that have not done trail races, the best strategy is just to bomb right through it. You are going to get muddy and wet so you might as well get through it quicker. I dislike when runners slow or stop on the path to try and avoid it. You also have a better chance of avoiding poison ivy if you run through it. While I didn't get pictures of it, there were several mud puddles that you could not get around. You had to go through them. The last big one I went through my feet were water logged and mud covered. No need to run around it anymore now if you were trying to avoid it before. I ran through my last mud puddle and it was over ankle deep. I was sure not expecting it to be so deep! Haha! We were now off the trail and heading back to the parking lot. We made a little loop around the parking lot and was was able to remain on the grass instead of the cement. We then headed back to the park area passing by some spectators who were cheering us to the finish. 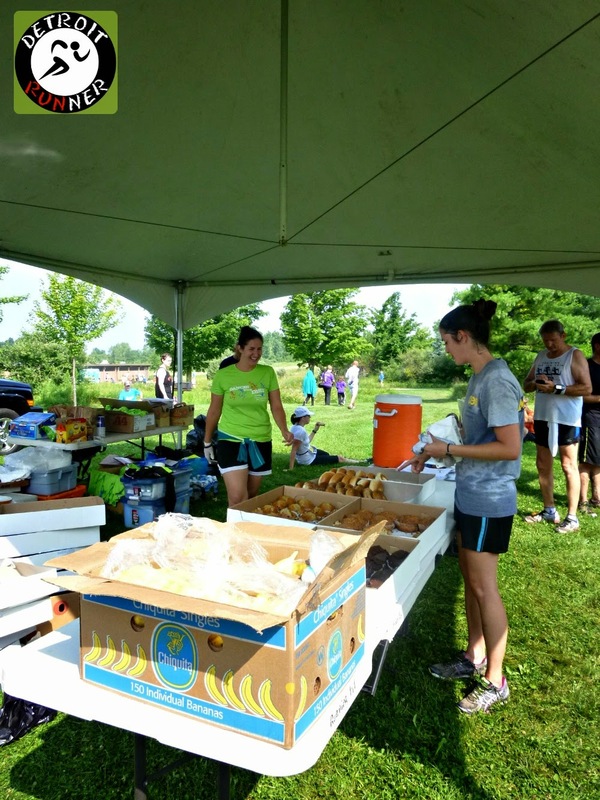 The aid stations were well stocked and had plenty of volunteers. 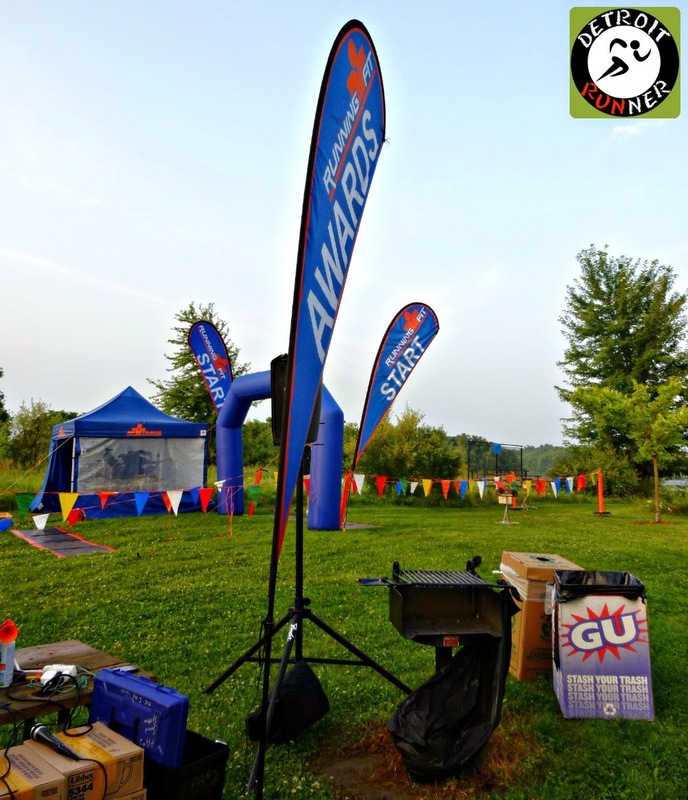 They had Gatorade and water at the aid stations as well as GU at one of the stations too. They were evenly disbursed on the course. I didn't use them because I was testing some new water bottles I wanted to use for my full but was happy to see them out on the course for everyone. The finish area was back at the starting area. They had muffins, bagels, and bananas for the runners. They must have had cookies too as I got the last one. I do enjoy the muffins since it's nice to have something different. I wish there had been more cookies though. I took a picture of my shoes after the race before taking them off. I'm really glad I took a change of clothes and shoes given all the mud and water on the course. My buddy and I cleaned off at the beach at the lake after the race. As you can see, they were quite muddy and wet. When I got home, I cleaned them off in a bucket of water and dried them out in the sun. They are as good as new and ready to be used again. 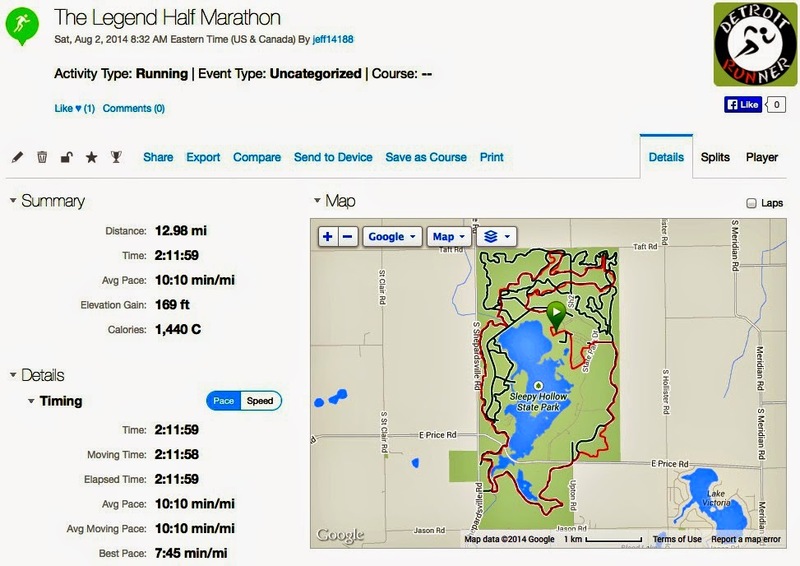 For your race entry(I paid $46.50 including online fees), for that, I received a timed and supported trail course. While it was open to traffic, there were only a few road crossings so it was very safe. Your bib had a QR code so you could get results instantly after your finish. They also had results at the finish. You also received a tech race shirt. In this case, the shirt is an A4 brand. This was probably the biggest disappointment of the entire race. One of the best things of last years race was getting a Brooks tech shirt. 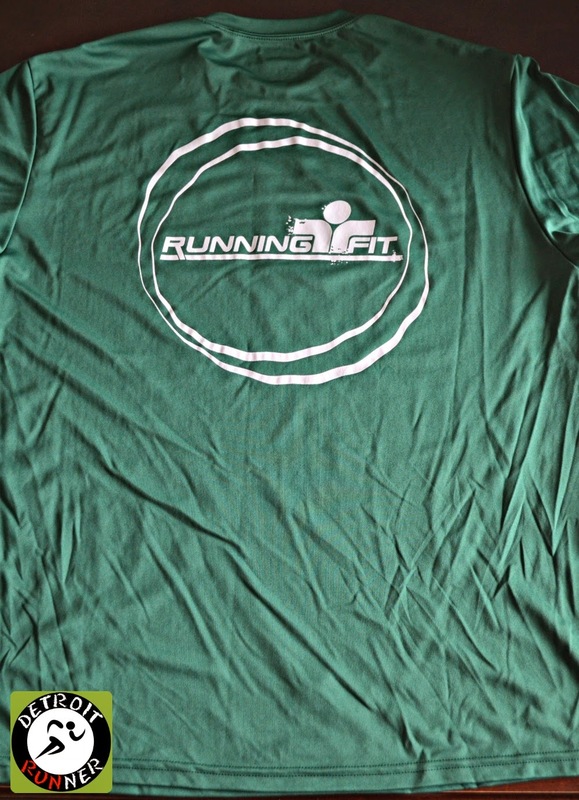 The A4 shirts run big and when you run in it, it feels like running in a tent. I tried to get a smaller size after the race but the registration tent with shirts were gone. Had it mentioned the branch on their website, I would have chosen a smaller size. I hope that Running Fit does not start cheaping out on the shirts. It's one of the things I really like about their races. Unfortunately this shirt will only get worn for the occasional bike ride or the pool. It's a shirt I would rarely run in. I would ask that all race directors(not just Running Fit) go run a half marathon in August in this type of shirt then decide if it's what you would wear? 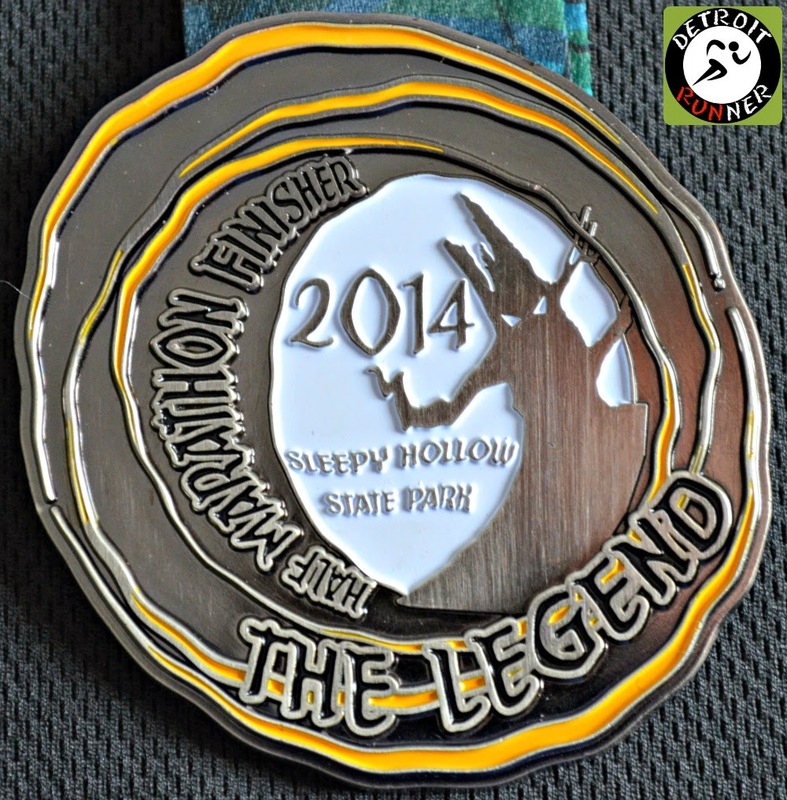 The race also gave finishers medal and this years was awesome. They really stepped up their medals this year and this was much nicer than last year. I love the design and the custom ribbon too. A great improvement! As would be expected from Running Fit, they did an excellent job at organization. The registration process is easy. The website is always informative. The start area and finish area are well planned out. The course is well marked with flags. The results are immediate. The volunteers are plentiful and nice - most of which are runners working for a race discount. Excellent job! Overall another excellent experience running the Legend half marathon. 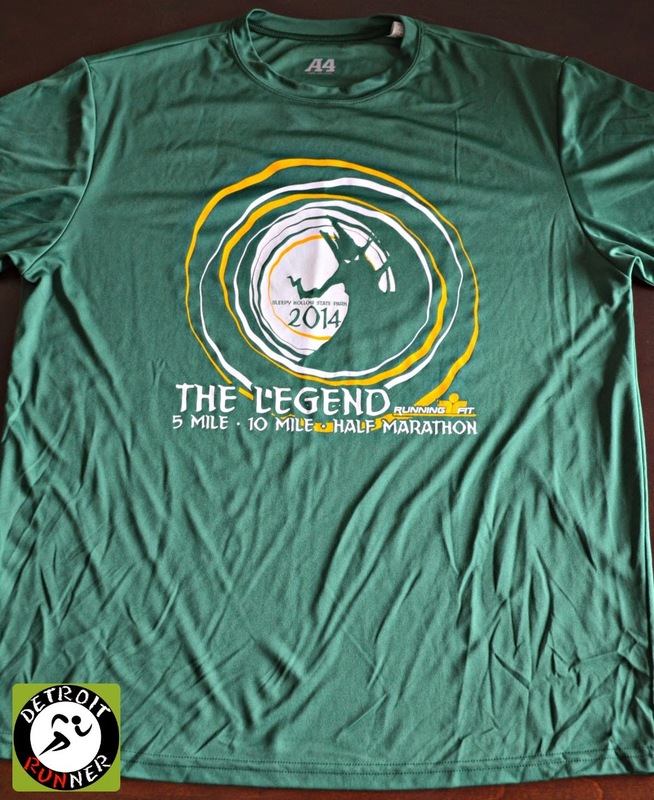 Running Fit has done an excellent job on their races this year and the Legend was no exception. Was it muddy? For sure! But it's a trail race and in my opinion what makes it fun. Bring on the mud every year! If you have not run the Legend, you are missing out. LOOKS LIKE YOU ARE BECOMING THE LEGEND! Looks like a race that I need to do! Love the medal and the mud! Thanks for a great report! Well done, your time is good for the muddy course. A really beautiful green trail.